Show off your culinary chops and plating prowess with this comprehensive food styling kit. Show off your culinary chops and plating prowess with this comprehensive food styling kit. The utensils included were designed to expertly handle your molecular gastronomy creations, including frothy foams, spheres, and caviar-style pearls that explode with flavor. Four natural, plant-based food additives, two recipe DVDs, plus a booklet of tips and tricks provide an introduction to this tantalizing food trend. Made in China. 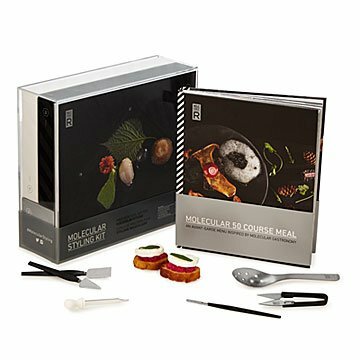 Take a deeper dive with our Molecular Gastronomy and Mixology Kits. Food scale [not included] is required for some recipes within cookbook. I would buy this product without questioning! I love to try new things and this definitely is something special! I will create new things, flavors and plates with this knowledge! This targets my creativity in such a way! I don't know where it will take me! The book is absolutely beautiful, with stunning photos for each recipe. I've tried a few so far, and they all turned out spectacular. The food styling tools are well made and surprisingly easy to use, and last but not least the design of the whole thing is gorgeous! Perfect for entertaining or as a gift for that foodie loved one.